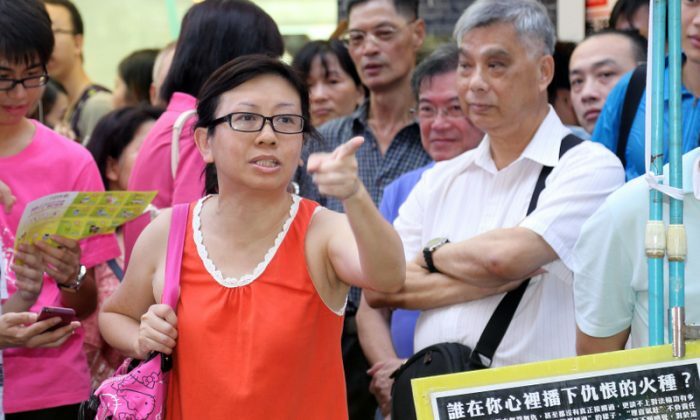 HONG KONG—A schoolteacher that upbraided Hong Kong’s police for failing to protect Falun Gong practitioners being besieged in the street on July 14 by a Chinese Communist Party front group has received an outpouring of support after pro-CCP media attacked her. A video of Lam Wai Sze arguing with police went viral after it was posted online on July 25. However, it had been doctored and made to present the teacher as the aggressor, and was posted on the website of Oriental Sunday, a pro-Chinese Communist Party magazine in Hong Kong. More complete footage showed that the schoolteacher’s intervention only came after the Hong Kong Youth Care Association, a front group associated with a Chinese Communist Party agency, began harassing Falun Gong practitioners. Wearing a red dress and glasses, she spoke loudly to the police in Mong Kok, a shopping district in Hong Kong, while admonishing them with her index finger. Between pauses in her statements, several in the crowd clapped in support. Her voice rising, she said, “You police are protecting these communist bandits?” Soon after, police threatened and yelled at the teacher. Oriental Daily included a comment with the video praising the police for “calmly dealing with the teacher,” and denouncing her. Yet despite the campaign to attack her, when the full story emerged Lam was given a robust defense by Hong Kong people concerned about the activities of the Youth Care Association, which is widely seen as a proxy for the Chinese Communist Party in Hong Kong. The Youth Care Association is known in Hong Kong as the group responsible for blanketing the city for 10 months with banners that slandered Falun Gong in language drawn from CCP propaganda, until the association was finally forced to take the banners down in April 2013. Since June 2012, the association has continually harassed Falun Gong practitioners, sometimes violently, in the face of which the Hong Kong police have been passive, as they were on July 14. The Youth Care Association shares an office building and staff in Shenzhen with the 610 Office, a Party agency that oversees the persecution of Falun Gong in China, according to a Next Magazine report. The association’s leader is a Communist Party official from Jiangxi Province in mainland China. “Hong Kong needs more teachers like Lam that teach compassion and truth, rather than communist brainwashing,” a netizen commented in a Chinese media report. “The Chinese communists aren’t as powerful as you may imagine. We just have to stand up to them,” said a radio station host, surnamed Ma, stating that despite Lam’s school having received over 900 emails denouncing her, a public event would be held every Sunday to promote freedom. Translation by Frank Fang. Ariel Tian contributed research. Written in English by Shannon Liao. On a visit to Hong Kong the Hon. David Kilgour found threats to liberty there, along with cause for hope.